SAN DIEGO -- The Padres got a glimpse of their future Friday night as one of its top pitching prospects shut down the Phillies. Jacob Nix pitched six strong innings in his major league debut and the San Diego Padres beat the Philadelphia Phillies 2-0 on Friday night. "It was a fun night for him," said Padres manager Andy Green. "The fastball command was there from the beginning." "I've worked my whole life for this moment," Nix said. "I'm on cloud nine right now." 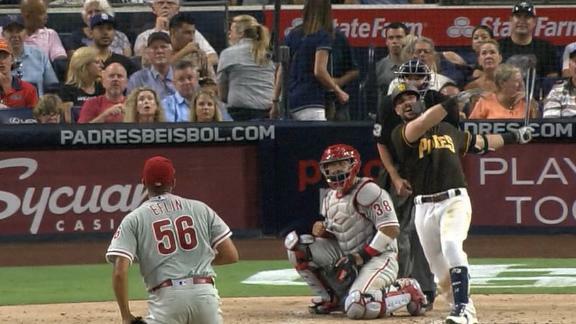 After settling in, Padres fans and Nix' contingent of 60-plus guests grew noticeably louder each time he recorded an out. "I could hear my grandma, she's always been the one I can hear," said Nix. Hedges caught Nix while on a rehab assignment earlier this season and says he remembers Nix dominating then and dominating now. "You couldn't even tell it was his debut," said Hedges. "We were in the game the entire time, had opportunities to score, we were not able to capitalize on those opportunities." said Phillies manager Gabe Kapler. "That's the story of the game." Austin Hedges hits a solo home run that adds to San Diego's lead over Philadelphia in the bottom of the fourth inning.